Yeah, yeah, yeah (you’re probably thinking), I know I need to make a gauge swatch. This isn’t about the need or even the how, but the what the heck do you do when . . . . So as many of you that have taken my gauge class knows, I’m not a fan of just measuring the entire width of a swatch to get your gauge. This method (for me) has proven to be very inaccurate, especially when designing a garment in negative ease where the gauge will really matter. If it’s top down and the row gauge really matters, then it’s doubly important. Like when I was swatching for the Nadia Pullover. I’m a believer in counting your stitches and rows. The reason is, the anatomy of those end stitches is just not the same as the stitches in the middle of the fabric. So I cast on my gauge swatch, doing the speed swatch method to simulate knitting in the round (I wrote an article about it for Creative Knitting), blocked it, let it dry and then took it out to measure. One problem, the yarn was both dark, fuzzy with little flecks of bling that made seeing the stitches pretty difficult. Trying to measure swatch which made my eyes feel like . . .
Now I could see my stitch and row gauge!! Who said TV can’t teach you anything. Description: You know the basics of gauge, but how do you make your own gauge work for you! Stop trying to match the gauge exactly and learn how to knit a project to YOUR gauge. After a review of the basics, and how to make a “truthful” swatch, we’ll get to some of the trickier elements of gauge, such as pre blocked vs. blocked gauge, hung gauge, and the difference between yarn gauge and pattern gauge. 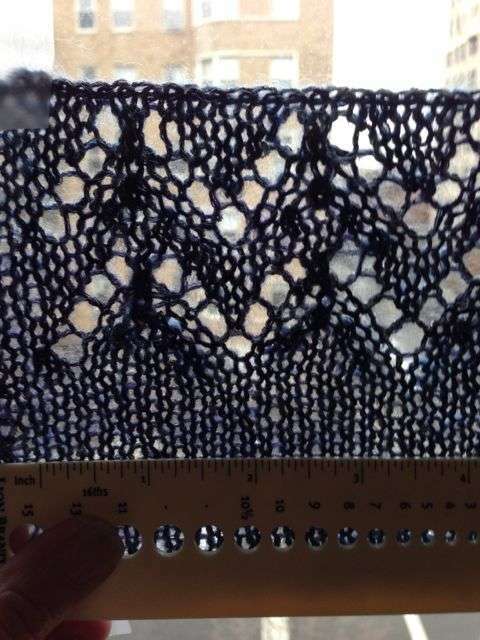 We will explore what to do when a project is knit in the round or in a pattern stitch. Finally, we’ll master the math of using your gauge, not just the pattern gauge. We’ll learn how to work an existing size with a different gauge, resize a sweater by using a different gauge, how to add different stitch patterns to your garment, and how to make adjustments to your pattern when your row gauge is off. Stop trying to match someone else’s gauge and discover the joys of making YOUR gauge work! Duh ……….. How simple and logical. This tip is gold to a senior who must knit under a bright light. That’s why your fans love you!